With Pokemon Sun & Moon already out, I'm excited to get my copy in the mail. I was a huge fan of some of the features introduced in X & Y and hope they make their return in Sun & Moon. Other than watching a few trailers, I haven't sought out too much information on the newest generation of Pokemon games. Z-Moves sound like a neat addition to combat, much like how I felt about Mega Evolutions in the previous generation. I'm super pumped they are doing away with "HM Slaves" by letting you call in a Pokemon to rock smash/surf/strength/fly. It bummed me out to always have least one slot of my party filled with a Pokemon that knew HM moves when I wanted to go explore the map while leveling my party. 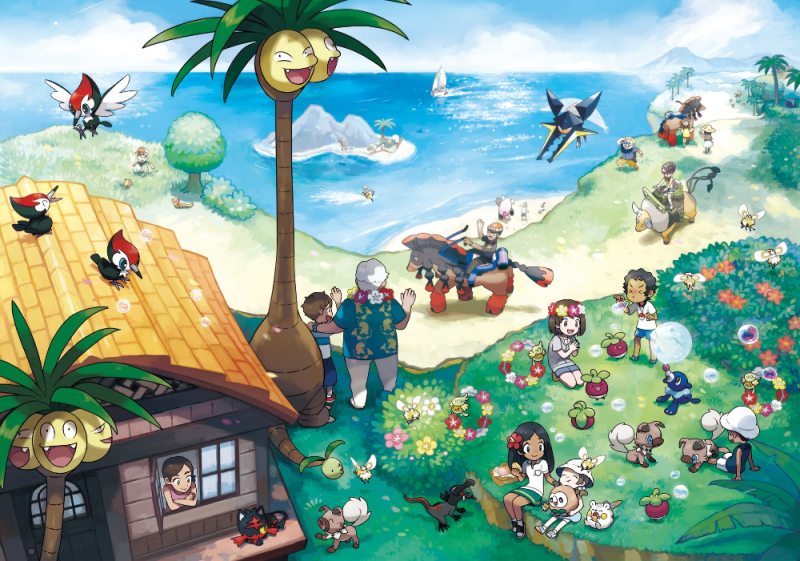 The Alola Pokemon are a nice way to celebrate the 20th anniversary of Pokemon (ugh,I feel old). I have not seen too much about the Alola variants but I think my favorite so far is Dugtrio. LONG HAIR DON'T CARE. Another new spin on something old is that there apparently are no more gym battles but "island challenges" instead? It sounds like you're set to do some tasks instead of facing the gauntlet of trainers and puzzles inside a Pokemon Gym. It has me really excited to try it out. I tried out the demo a few weeks ago and it had me take pictures of certain Pokemon in a cave(which provoked them into fighting me) before I fought a "Totem Pokemon" to pass that particular challenge. I look forward to seeing what these island challenges are about when I play the full version. ...I'm seriously going to make a team of Pokemon with majestic flowing hair.Naturally Mega Ampharos will be in the first slot with Alola Dugtrio in the second slot.I'm so pumped.